help retailers and brands connect with shoppers whether they’re at home, on the go or in the store. Starting today, Comparison Shopping Services have a new opportunity to use Shopping ads to advertise on Google.com in EEA countries1 and Switzerland on behalf of retailers they represent. Google Shopping in these countries will operate in the same manner, bidding alongside Comparison Shopping Services on equal terms. If you run a Comparison Shopping Service and are interested in learning more, visit our help center. European retailers of all sizes will still be able to reach consumers using the same Google Shopping tools and insights they use today. And as shopping intent begins to rise for the holiday season, we'll keep launching new innovations that make Shopping ads work even better for everyone. 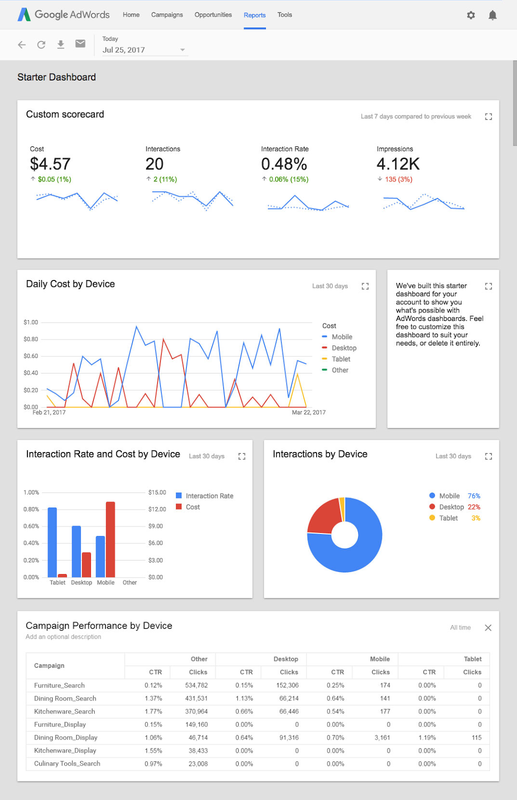 , we'll be moving all AdWords app install campaigns to Universal App Campaigns (UAC) later this year. 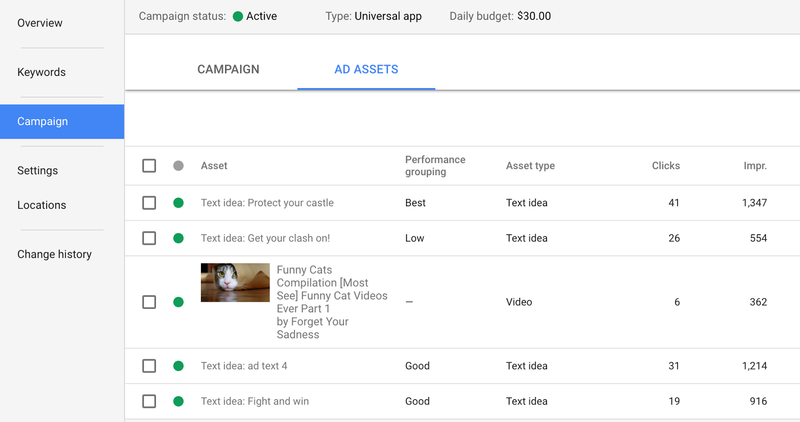 As you may have heard, we'll be moving all AdWords app install campaigns to Universal App Campaigns (UAC) later this year. Campbell’s Soup used Director Mix to create videos with clever copy based on the content people were about to watch. For instance if you clicked to watch clips from Orange is the New Black, you’d see a bumper asking “does your cooking make prison food seem good? We've got a soup for that.” And it worked: Campbell’s earned a 55% lift in sales and a 24% lift in ad recall with this campaign. To drum up excitement for their new Assassin’s Creed game, Ubisoft cut four sequential six-second bumper ads, each with a critical element of their longer trailer. The brand used Affinity Audiences and Video Ad Sequencing to serve the ads to core E3 audiences. The campaign reached almost 15 million unique viewers and resulted in best-in-class lifts in awareness (+25%), search lift for ‘Assassin’s Creed’ (+224%) and search lift for the Assassin’s Creed trailer (+375%). We’ve also expanded our Oracle Datalogix ROI offering in the US to include six-second bumper ads so that brands can more comprehensively measure their YouTube campaigns. And we’ll continue working to deliver more solutions to complement our Nielsen MPA, Oracle DLX ROI, MMM and store visit offerings today, so you’ll have the measurement that works best for your business. to generate more phone calls from mobile search. We are now introducing upgrades to call-only ads, starting with the launch of ad extensions. For the first time, you’ll be able to show ad extensions with call-only ads to promote more relevant information about your products and services, and give people more reasons to choose your business. In early experiments, we’ve found that implementing new extensions to call-only ads can improve clickthrough rate by 10% on average. Advertisers and agencies like Hertz, Vortex Industries and DexYP will be taking advantage of extensions to enhance their call-only ads with additional details and improve their visibility in search results. If you already have location, callout, or structured snippet extensions set up at the account-level, you don’t need to take any extra steps - the extensions will automatically be eligible to appear with your call-only ads. You can also tailor the messaging on your extensions at the campaign-level to help them work better with call-only ads. For example, highlight your fast call center service or offer a special discount when customers book an appointment over the phone for the same week. To learn more about call-only ads, visit the Help Center and check out best practices for driving more calls to your business. When people want dedicated service or to get specific questions answered, they often pick up the phone to speak to a real person. Advertisers also drive more value from having these direct conversations with customers - on average, calls convert three times better than web clicks. Hundreds of thousands of advertisers are already using call-only ads to generate more phone calls from mobile search. We are now introducing upgrades to call-only ads, starting with the launch of ad extensions. For the first time, you’ll be able to show ad extensions with call-only ads to promote more relevant information about your products and services, and give people more reasons to choose your business. In early experiments, we’ve found that implementing new extensions to call-only ads can improve clickthrough rate by 10% on average. With Shopping available in 37 countries, don’t miss the opportunity to bring your products to new global customers. Simply add new countries with the same language to your primary feed and your prices will automatically show in the correct currency of the user. You can also reach new countries with different languages by applying Feed Rules to pull language-dependent values from a supplemental feed, like title and description. Now’s the time to add international expansion to your holiday plans. Look out for additional updates as more functionality is added to Feed Rules. 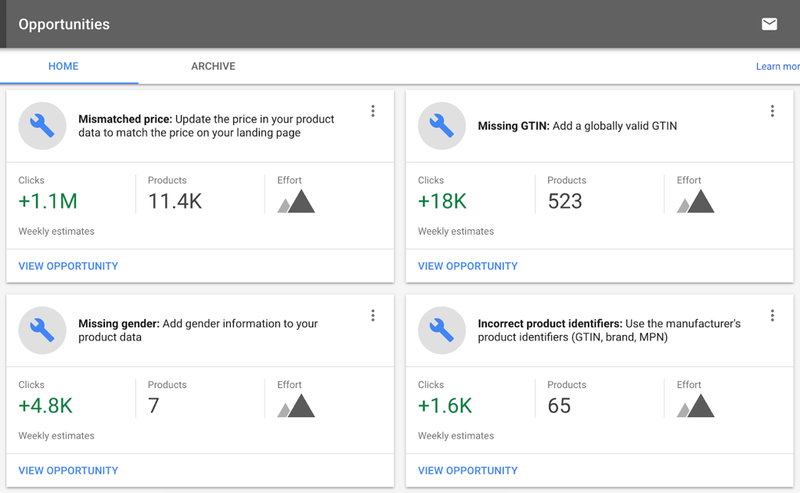 Get a better idea of the potential results and effort needed to improve your product data or campaigns in the Opportunities tab. A card will appear if there’s enough information to surface an opportunity. From minor adjustments to important feed fixes, each card pulls in dynamic information to help you prioritize your resources and drive more clicks to your account. Initial cards will show on a limited basis and focus on improving your product data quality. But, this is only the beginning -- expect more opportunity types in the future. Check the Opportunities tab regularly as it's constantly working in the background to spot opportunities for you. And, make it a goal to address any high-value opportunities before heading into the holidays. The days of setting one primary contact and one technical contact are over. You can add multiple team members as either Admin or Standard users to your Merchant Center account. Each user can manage their own email preferences to opt into important news and notifications, including feed alerts, tips and best practices, and beta opportunities. You can also specify email-only users, who will receive communications but can’t log into your account. Before the holiday season, keep your team in the loop by adding them to your Merchant Center account. Learn more about the new feeds experience and Opportunities on Merchant Center Help Center. Or, log in to Merchant Center to explore the new features. High quality product information is the foundation for connecting retailers with the most qualified customers on Google Shopping. Luckily, getting your product data in shape has never been easier with new Merchant Center tools. The new feeds experience and Opportunities are here just in time for you to win this holiday season. 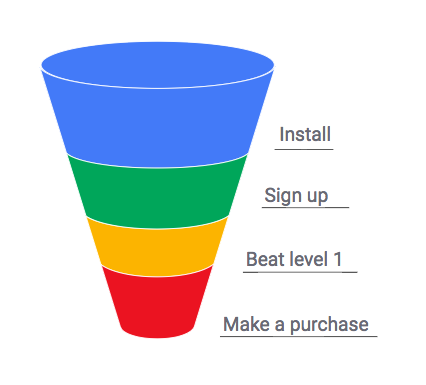 that we'll be moving all AdWords app install campaigns to Universal App Campaigns (UAC) later this year. Continuing with our example: Based on what you've learned from the report, you decide to replace any assets that have been rated as “Low” with even more thrilling cinematic video assets. You also notice that some of your assets still have the label “Learning.” You wait until there’s more data before taking action on those. In other words, if you’re sending your customers to slow-loading landing pages, you’re missing out on potential traffic, engagement and sales. We know that a better landing page experience results in a better ad experience—that’s why your landing page experience is such an important factor in how Google determines ad rank and pricing. By directing your search ad clicks to AMP landing pages, you can create the super-fast and delightful mobile experience that consumers expect. To get started, check out the AdWords Developer's Guide for AMP and learn how to create AMP landing pages. To see the percentage of clicks that go to invalid AMP pages, visit the "Landing Pages” page in the new AdWords experience. You can then work with your webmaster to ensure your landing pages comply with AMP guidelines and fix potential issues. 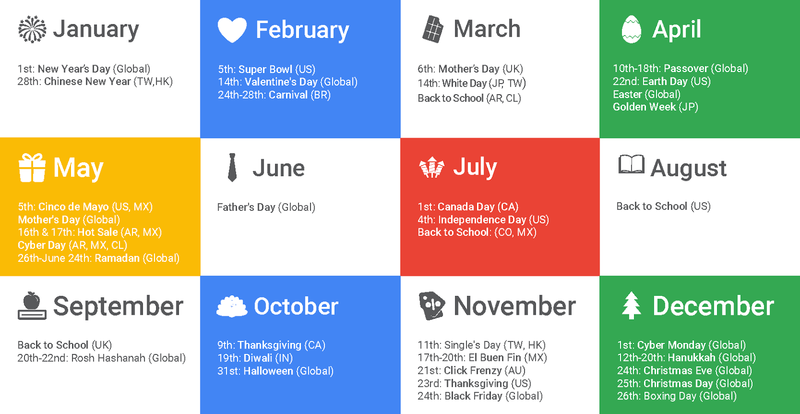 Whether it’s Diwali, Back to School, Christmas or Boxing Day, shoppers go online to purchase gifts globally. Here's how you can capture the attention of global shoppers with Shopping ads.